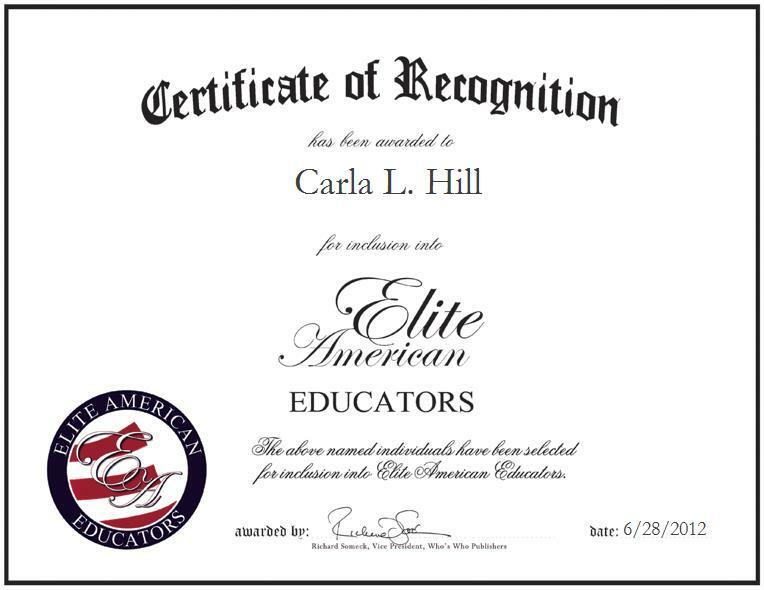 POUGHKEEPSIE, NY, June 28, 2012, Carla L. Hill, Teaching Associate at Marist College, has been recognized by Elite American Educators for dedication, achievements, and leadership in statistics and information technology as an educational tool. At her current post, Ms. Hill, an expert in the use of statistics and information technology as an educational tool, makes the most of her sprawling knowledge of the topic by developing curriculum for students in statistical mathematical courses. She conducts evaluation in all phases of usage of information technology in concurrent implementation for overall evaluation of quality assurance standards for meeting criteria, and utilizes and implements technology as methodology of enhanced value for development of educational tools for students. With a wealth of knowledge and experience under her belt, Ms. Hill has garnered a reputation of distinction for her capabilities. She has received a Special Services Award for Working with Students with Learning Disabilities, and she continues to strive for excellence in her every endeavors. She has amassed more than 33 years of professional experience, and attributes her success to her open-mindedness and love for working with young people. Ms. Hill speaks publicly on topics related to her profession, and she remains abreast of trends and developments in her field as a member of such industry-oriented associations as the Indian Society for Technical Education, MAA, SAS, and SALT. She is currently pursuing a doctorate degree with a concentration in educational technology.